I’m not a big fan of religious symbols on government property. I believe there is a detriment because it dilutes the real purpose of the symbol. They’ve taken a symbol of the church and turned it into civil religion. This can be bad for evangelicals because when people look at a nativity scene or a Roman cross, we want people to think of the God of the Bible. If these too become simply civil religion to Americans, it makes the task of evangelism harder for Christians. She has not said whether she would sign or veto the bill. Lingle has 45 days to decide. If she vetoes the bill, the House and Senate can come back in a one-day override session in July. Functional magnetic resonance imaging (fMRI) was the window Uffe Schjødt used to peer into the brains of 20 Pentecostalists and 20 non-believers listening to 18 different recorded prayers. The volunteers were told that six of the prayers were read by a non-Christian, six by an ordinary Christian and six by a healer. In fact, all were read by ordinary Christians. Among the devout, parts of the brain which play important roles in vigilance and skepticism tended to be markedly less active when they were listening to prayers by someone identified as [but who was not] a Christian with healing powers. 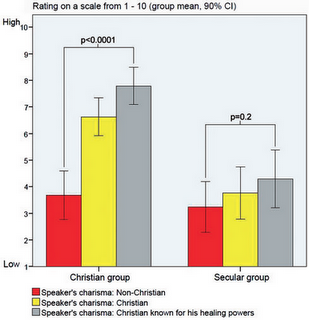 Asked about the speakers, Pentacostalists verified the fMRI findings by giving their highest rankings to speakers identified as Christians with healing powers [note the graph at right]. Thus suggesting, as Schjødt observed, that Pentacostalists effectively handed themselves over to those merely identified as Christian healers. These observations point to an important mechanism of authority that may facilitate charismatic influence, a mechanism which is likely to be present in other interpersonal interactions as well. Simply that we imperil ourselves and others when we allow our protective vigilance and skepticism to be turned off. Duggit informed us that he’d found a load of old rotting wood on Langley Hill, which when strategically placed, appear to form the outline of Noah’s Ark, complete with animal cages, water feeders, a broken tropical fish tank, and a rusty supermarket trolley, which Duggit assumes was used by Noah to ferry supplies of animal feed from a local Tesco store to the Ark. When we pointed out that Langley Hill is a long way from Mount Ararat, Duggit explained that Noah was probably an economic refugee, who set sail in the Ark in search of agency work at the nearby BSA motorcycle factory. Langley Hill is of course in England [read the entire spoof]. More seriously and similarly credible, an evangelical Christian Hong Kong filmmaker and Turkish scientists say, ABC News reports, that they have found Noah’s Ark encased in ice on Mount Ararat. Southern Baptist Laura Silsby faces up to three years in Haitian prison if convicted of the remaining charge of “organization of irregular trips” under a 1980 statute. That charge was brought to bear against her in mid-March. Other charges against her and all charges against the remaining nine Baptists have been dropped by Judge Bernard Saint-Vil, according to the Associated Press. According to MSNBC, Judge Saint-Vil concluded that Silsby “knew she had no right to take the 33 children out of earthquake-ravaged Haiti” and she deceived the other nine by telling them she had the documents required to take the children out of Haiti. The initial charges resulted from their attempt to take 33 children out of Haiti after the Jan. 12 earthquake. Silsby faces trial as a result of evidence of a Jan. 26 attempt by her to bus child earthquake survivors to the Dominican Republic. As we reported earlier, Silsby was warned repeatedly prior to the arrests that her plan was illegal and would be regarded as child trafficking. The Haitian law under which Silsby is charged restricts travel out of Haiti and was signed in 1980 by then-dictator Jean-Claude Duvalier. It carries a penalty of 3-6 years. Brainquake is a Facebook call for Islamic women to use a demonstration of their intellectual firepower to fight the oppression visited upon them by oppressive Iranian clerics. Let’s create a “Brainquake” and show off our resumes, CVs, honors, prizes, accomplishments (photo evidence) because the Hojatoleslam and the Islamic Republic of Iran are afraid of women’s abilities to push for change, to thrive despite gender apartheid (Did you know that over 64% of students studying at universities in Iran are women?) Let’s honor the accomplishments of Iranian women by showing off our abilities, our creativity, our ingenuity, and our smarts on our blogs, on Wikipedia, on Twitter, on Youtube, on Flickr and all over Facebook. Remember to use hashtag #brainquake on Twitter. World-wide, the sexualisation of women and younger girls, as young as pre-schoolers is a genuine problem and as mothers, feminists, and young women ourselves we believe that it is time to move away from this “bare it all” mentality. You may follow the Brainquake at @negarpontifiles, and you may join it by addressing a tweet to that account. April 26, 2010 Posted by baptistplanet | Politics, Religion	| Boobquake, Brainquake, Iranian cleric, Islam, oppression, women | Comments Off on Brainquake rather than Boobquake? A plan is in the works to call for the Southern Baptist Convention to distance itself from embattled seminary president Ergun Caner. Caner, president of Liberty Baptist Theological Seminary, is under fire for discrepancies in his biographical information, including whether his Muslim background. Fred Butler is not so subtle. He comes right out and asks if Caner is “the Mike Warnke of this generation” and sees similarities. Both Warnke and Caner are Christian celebrities, Butler notes. While Warnke passed himself off as an “expert” in Satanism, Caner is seen as an expert on Islam. And they were both popular as speakers. But more disturbing, Butler says, is the way their actions reflect on Christ. Gene Clyatt says the Caner situation is “like watching a train wreck.” He tells of plans for a resolution that would call for the SBC to disfellowship Caner and the seminary until he repents. Clyatt posted a draft resolution in the comments section of his post, which he concludes by asking Caner to repent and resign. Meanwhile, questions asked of Caner go unanswered. Oh no, Rubio! From outRichardLandish to uh-oh? Promoted by SBC ethics czar Richard Land as a credible 2012 Republican presidential nominee, Mario Rubio is under Internal Revenue Service investigation. The Miami Herald reports that Rubio is one of three former Florida Republican Party credit card holders being scrutinized for their alleged use of party credit cards to pay personal expenses. The principal effect, as Talking Points Memo suggests, is likely to be on the dynamics of Rubio’s fight with Florida Gov. Charlie Crist for the Republican senatorial nomination, without which Rubio becomes another Land loser.